Earlier in the year, I set up a site called Sexual Congress. It allowed the internet to vote on which members of the 111th United States Congress they found most attractive. It was rather popular, making its way into political blogs and — if my site's statistics are anything to go by — a lot of Congressional offices. Well, with over 800,000 votes cast and the November midterms swiftly approaching and bringing a wind of change — however slight — into the hallowed hallways and offices of Washington DC, I figured it was time to declare the winners. And, as I'm British, there's only one traditional way to award the winners of a meaningless, unscientific and slightly sarcastic competition like this: with cheap and tacky trophies. 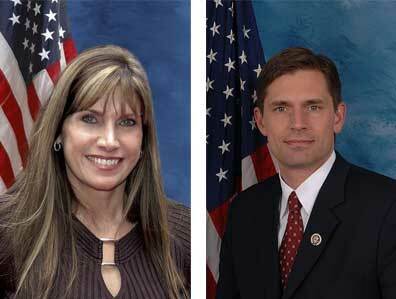 Congratulations to Martin Heinrich, the Democratic representative for New Mexico's 1st District, and Mary Bono Mack, the Republican representative for California's 45th District! 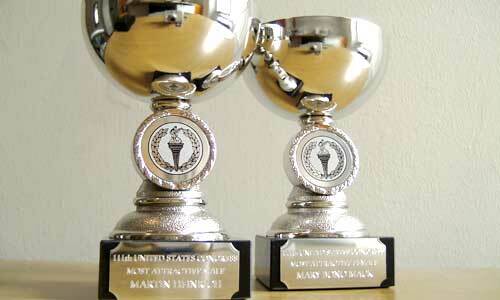 Okay, so the trophies are actually tiny. I couldn't afford enormous ones, no matter how cheap and tacky they were. 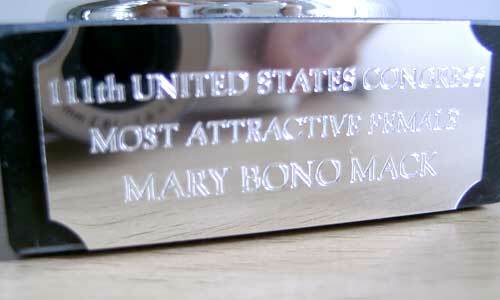 I did get them properly engraved, though. 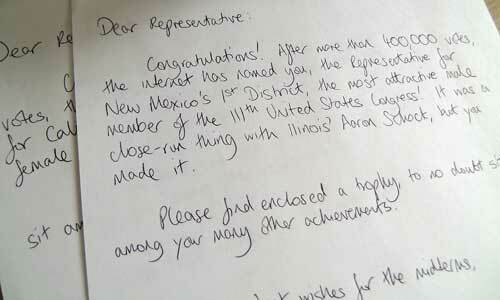 I hand-wrote a nice letter to the two representatives, congratulating them and wishing them good luck for the midterm elections. I've posted the trophies off to them, priority air mail. I'll let you know if I get a reply. Or if anyone from the Department of Homeland Security gets in touch. 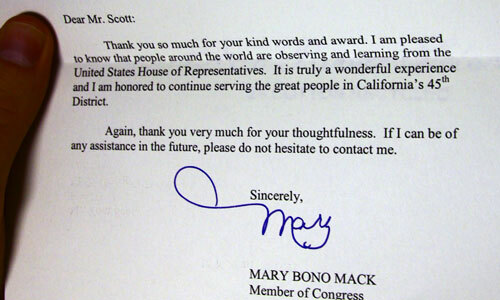 Update: Mary Bono Mack responds! 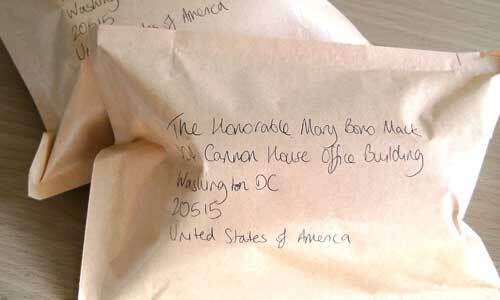 A letter from America! Well, I wonder what it could be? 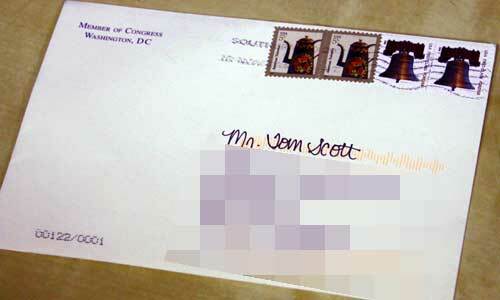 It has the seal of Congress on the back and everything, plus genuine American stamps. Aww. Thank you, Ms. Mack, and congratulations on your re-election.